The Riverwalk is closed for cleaning west of Wabash Avenue following record rainfall this weekend. DOWNTOWN — Restaurants along the Chicago Riverwalk expect to start reopening Tuesday after record rainfall this weekend put the Downtown attraction under water, city officials say. The Riverwalk remains closed west of Wabash Avenue as crews work to clean up debris and mud brought by the weekend flooding. Affected restaurants include O'Brien's Riverwalk Cafe, Tiny Tapp and City Winery. The cleanup comes after 4.19 inches of rain fell Saturday, making it the wettest October day in Chicago history, according to the National Weather Service, which recorded the rainfall at O'Hare Airport. 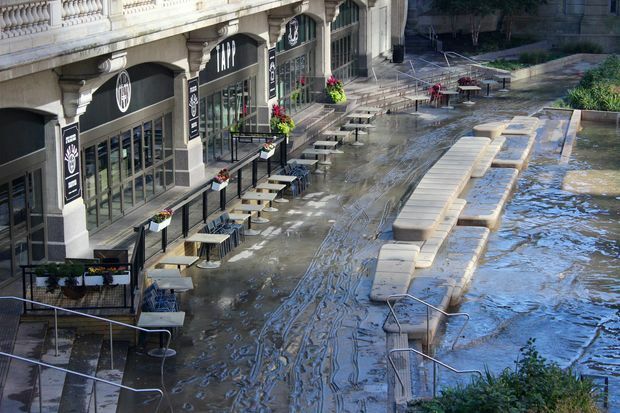 "While these events are rare, the Riverwalk was designed to withstand flood conditions during significant rain events," Tori Joseph, a spokeswoman for Mayor Rahm Emanuel, said in an email. "It is expected that the Riverwalk will flood as a result of significant rain events in the future and (the city) is prepared to address these events as necessary." The city opened the third leg of the Downtown Riverwalk last year after taking out a $100 million loan from the federal government. City officials now seek ideas to extend the Riverwalk along the north and south branches of the Chicago River amid a riverfront development boom. Joseph said elements of the Riverwalk including its "floating gardens" between Wells and Franklin streets were included to mitigate flooding that is expected during storms. The cleanup cost wasn't disclosed, but Joseph said the city's budget accounts for power washing and other post-flood cleaning. — Colin B Photography (@colinbphoto) October 14, 2017 "